Fate can leave you partnered with someone you never imagined: one second you're a Secret Service agent, the next you're teamed up with the former QB of the Los Angeles Stallions -- actually, who doesn't imagine themselves teamed up with Jimmy Dix? He's so good at sports! 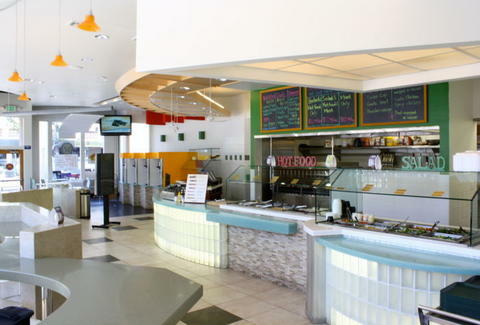 Now, frozen sweets are teaming with Brazilian meats, at Yogotango/Boi Preto Churrasco. Yogo first opened about two years ago in a space that proved too vast for the classic weigh-in yogurt shop; when faced with relocation or closing, the owner made a gambit to salvage the operation by installing a Brazilian churrascaria, thereby creating the most random combo since peanut butter and choco...wait, that makes the most sense ever. Like the yo', Churra fare is priced by weight, with three feasting options (meat only, salad/"hot food"/meat combo, and salad/"hot food"), all served buffet style; to start, pile on hots ranging from feijoada (black bean stew) to Chicken Stroganoff, and saladry from Middle Eastern tabouleh to crab -- regardless of species, they're blue to be in this buffet line. Then step over to the churrascaria to pick your rotisseried flesh of choice, with options including chicken (spicy, garlic, or bacon-wrapped), Brazilian sausage, bacon-wrapped beef, top sirloin, and sirloin cap, in case your Brazilian sausage believes in using protection. To slake your thirst, they've brought in five taps, bottled brew standbys, and wine by the glass/bottle, while dessert's only a few steps away with yogurts from Green Tea to various fruits, plus a wealth of toppings from Fruit Loops to cheesecake bits -- a bullet to your heart that your partner won't be able to stop with a football.